Tuesday marks what will likely be President Obama's last appearance on The Daily Show while he's in office and Jon Stewart is in the host seat. A frequent guest of the late-night circuit, Obama already saw off David Letterman and Stephen Colbert as each bowed out of their respective shows, and Stewart, at the very least, deserved the same acknowledgement — especially if you consider what a splash POTUS made when he first graced the Comedy Central show in 2010. It was a historic appearance since it was the first time a sitting president appeared on The Daily Show, but it also set up an encounter of such "cazh" levels because it delivered the memorable moment of when Stewart called Obama "dude." On a pimped out set in Washington, which included an Air Force One'd coffee mug for the president, Stewart and Obama talked about the country's big issues at the time, which were recovering from the Great Recession and passing healthcare reform aka the early stages of Obamacare. But much of the conversation focused on whether Obama was living up to his bold promises of change from his presidential campaign. After all, then 18 months into his presidency, Obama wasn't quite delivering results at speeds that satisfied his young and highly mobilized voter base. Near the end of the interview, Stewart asked Obama how an appointment like former Harvard President Larry Summers as an economic adviser signaled things were different this time around. (Summers had previously served as treasury secretary in the Clinton administration.) Obama went on to say Summer did a "heck of a job," which prompted Stewart to tell the President of the United States, First of His Name, Leader of the Free World, Commander-in-Chief of the U.S. Armed Forces: "You don't want to use that phrase, dude." Why, you ask? That's because "heck of a job" was the infamous choice of words used by Stewart's favorite presidential target George W. Bush to describe the disastrous work of former FEMA head Michael Brown in the aftermath of Hurricane Katrina. Obama eventually caught on the joke with a wink, but you could see that break of decorum didn't really sit well with him. Whether or not you thought it was a slight on Stewart's part, you had to give the man credit for sticking to his indiscriminate approach to interviews. The 2008 presidential election was my first, and I still remember what it was like to cast my vote for Obama and his message of change. 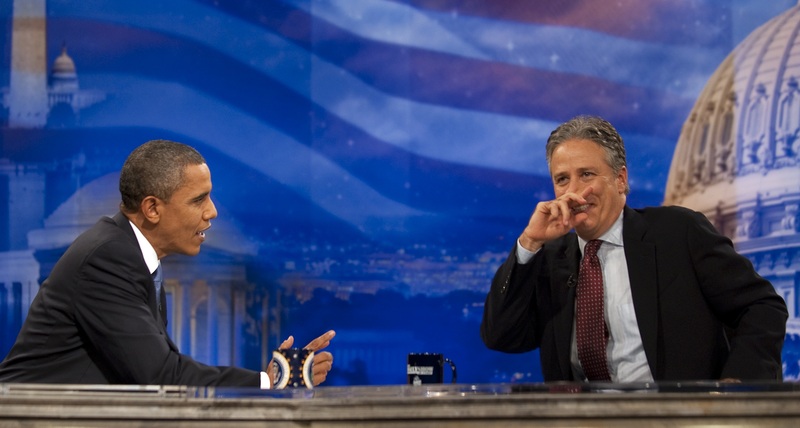 Now, nearly eight years later since he took office, and five years since his first Daily Show episode, it's crazy to think about how far we've come along. You might even say it's been one heck of a ride.